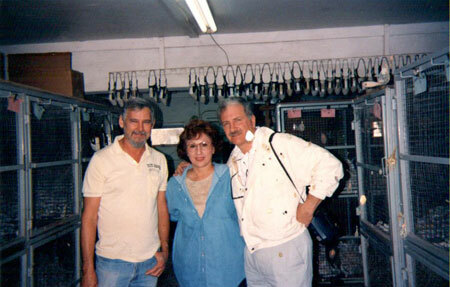 This photograph was taken in the early 1990s, when Jim Fritz, the gentleman to my left, from Fritz Kennels was one of those people supplying us with greyhounds for adoption. The Fritz Kennels at the time were one of the largest in the area off compound from what is known as Florida Kennels which, at that time, probably housed 50-60 kennels and currently may be the largest in Florida. Between Jim and me is Gay Latimer who was our Virginia affiliate for many years. You may note that I actually look younger in my Facebook picture.